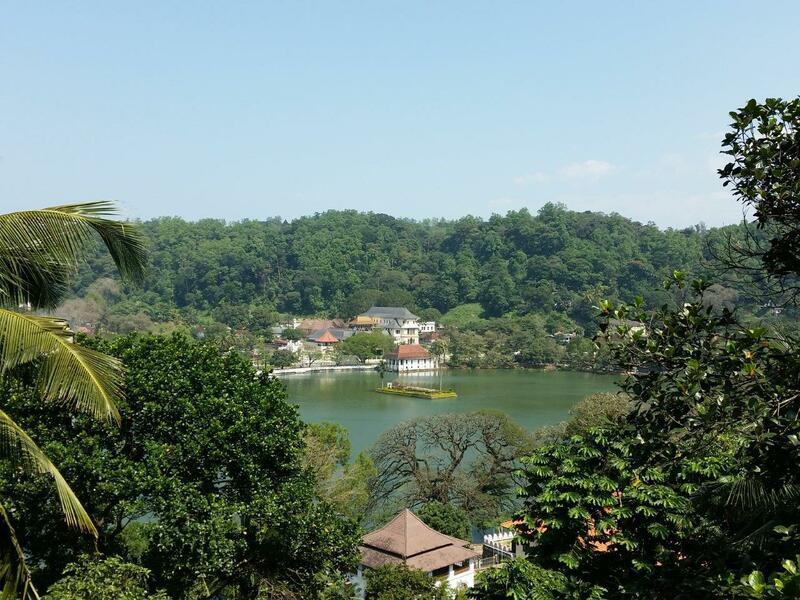 Liking the Sri Lankan city of Kandy or not, really depends on your taste. I would say there are two sides of the city. The sweet, and the sour. I am not really know to be fussy, and often find shabby rundown houses charming. 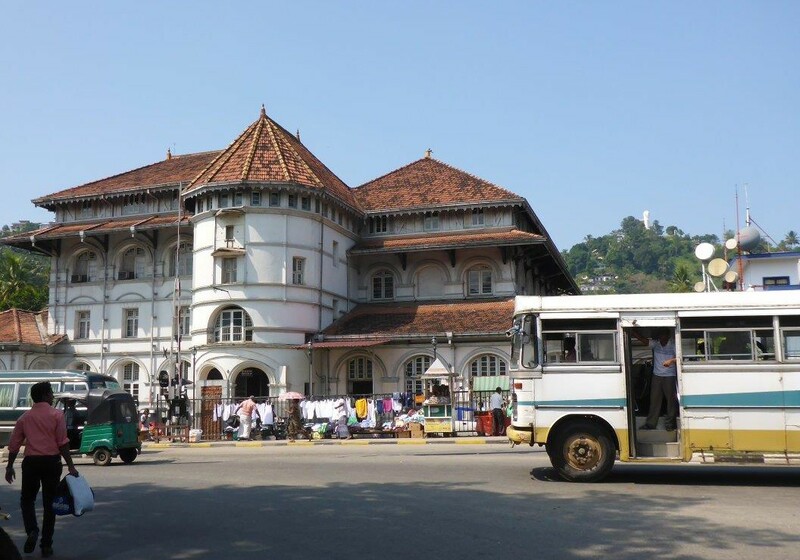 Kandy absolutely do have some pretty colonial houses, but the large ugly commercial signs tear down the impression. 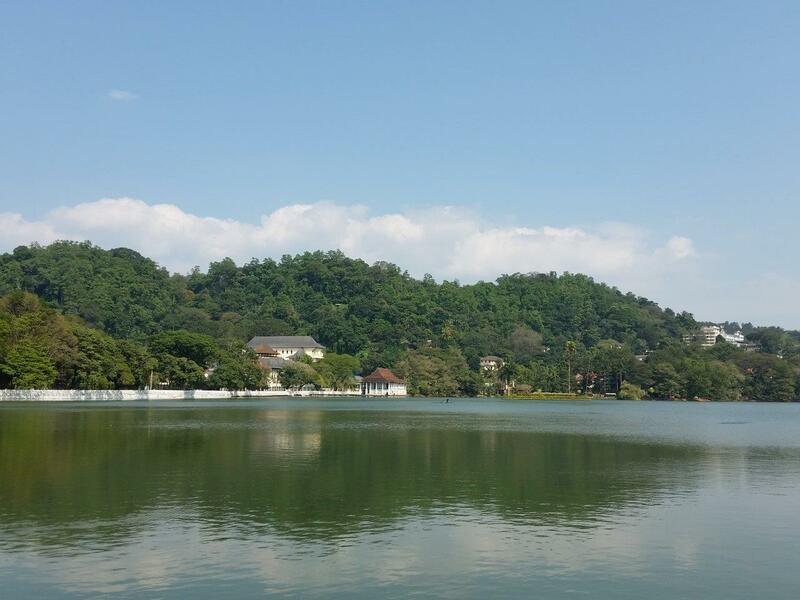 Kandy is built on five hills, with a nice lake at the East end of the city. 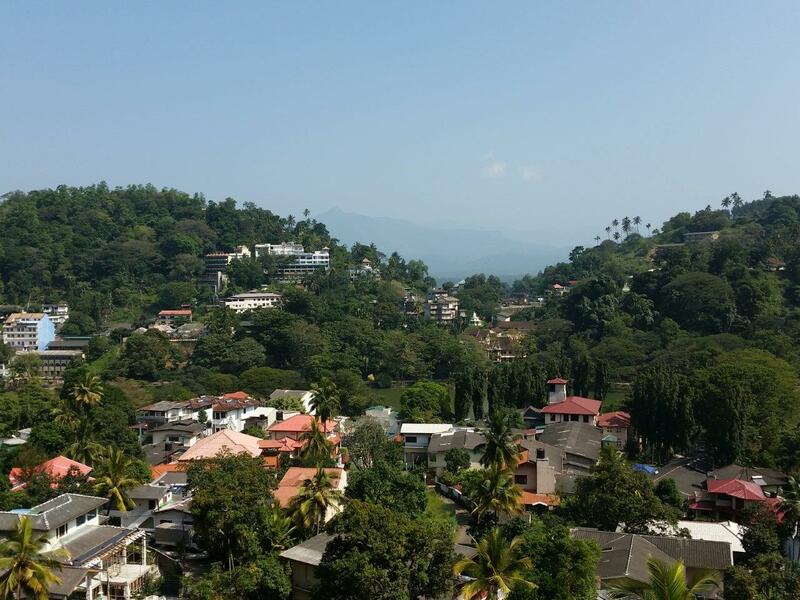 I had booked a room at Blinkbonnie Inn Kandy, situated at one of the hillsides. As our driver drove further and further up, and away from the city center, I started to regret my choice of accommodation. My doubt however, soon disappeared. Our room was clean and just the right size, with a nice balcony overlooking a quiet valley. Heading downtown for a quite late dinner in the evening, we decided to settle for the first place we laid our eyes on. That was The Pub. 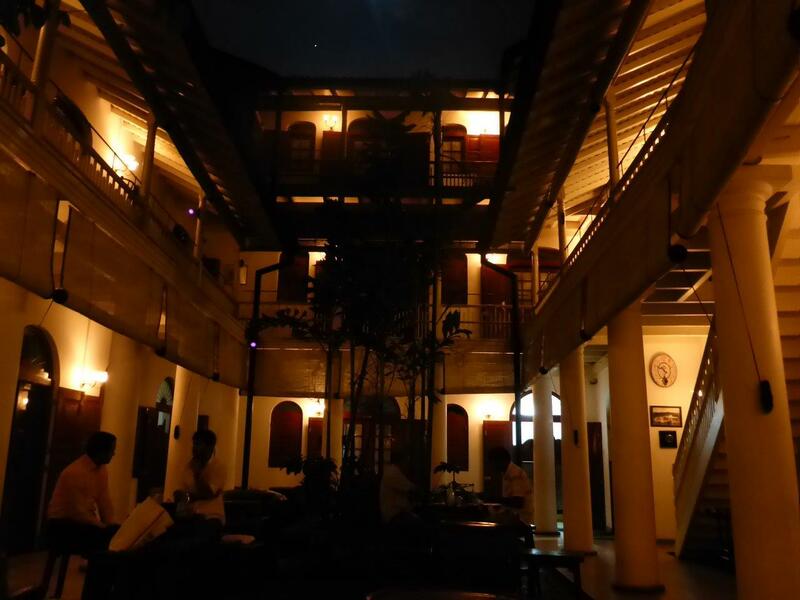 Located in a well-renovated colonial house, we found a place out on the balcony. Being keen on something else than Singhalese food for a change, this was just what we needed. A few stone throws away, we found the magnificent Royal Bar. A real gem with a unique atmosphere! The bright shining moon and the starry sky certainly underlined that. Sitting outside in the courtyard really make you feel like being back in the colonial time. The soft dimmed lights relieving the simple white columns and the bright red wooden doors and mullions. I just could not help thinking how it must have been living there at that time. The bright version of it, that is. 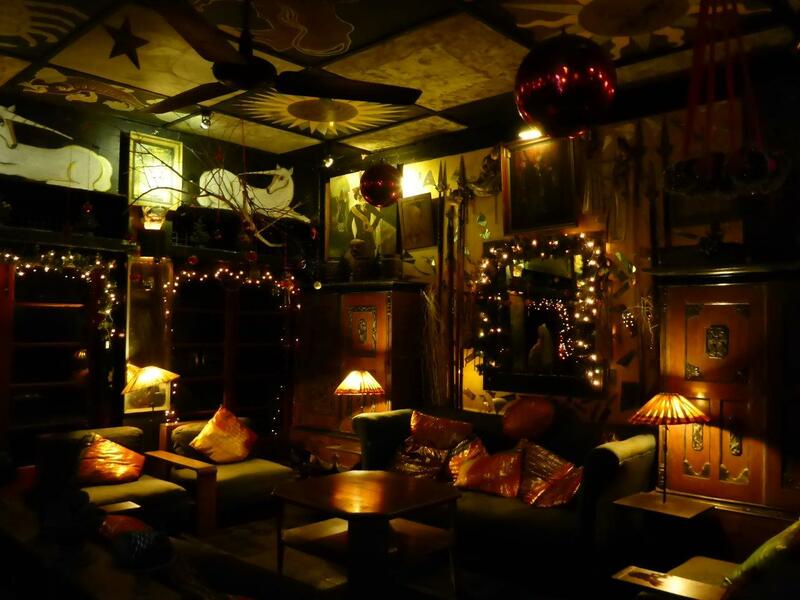 The magnificent and atmospheric Royal Bar. Sadly, this bar, like all other places, closed early, and we had to head back home after just one beer. The next day being Election Day, we were actually advised to stay away from the city. Good thing than that we had a balcony with beautiful view. The view from our balcony at Blinkbonnie Inn. However, we did not want to just stay put, so we went for a walk. Not far from Blinkbonnie Inn, we stopped at the fabulous viewpoint overlooking the lake surrounded by white-painted houses. A bit further down, we escaped the burning sun, enjoying a glass of iced tea. Still overlooking the lake and Temple of The Tooth. While walking down the hill, we almost did not meet any others. 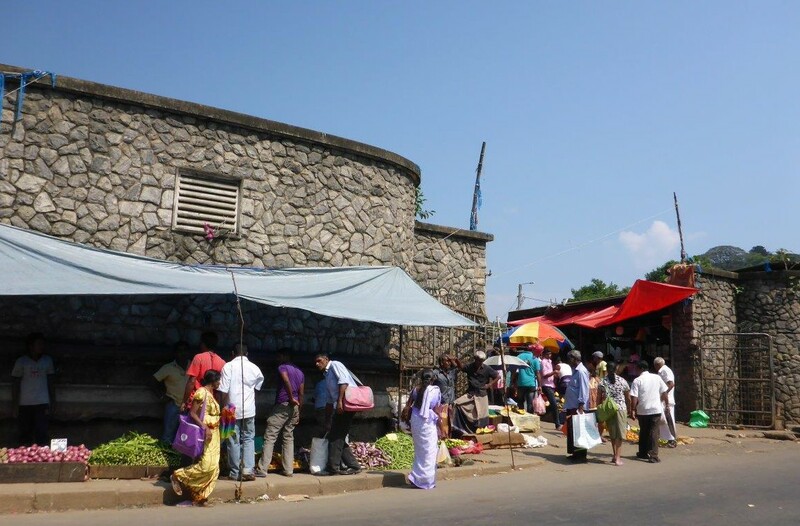 And downtown, where I assume it is quite bustling on a regular day, only a few people walked around. But it was just that; It was not just any given day. It was the day of the election, and the coming result was not at all obvious. We had met many people along the way, both the ones wanting the old president, and the ones with strong desire for change. We had felt the tension, and understood the ones warning there might be trouble. So the people stayed away, minding their own business. Leaving the streets more or less empty. 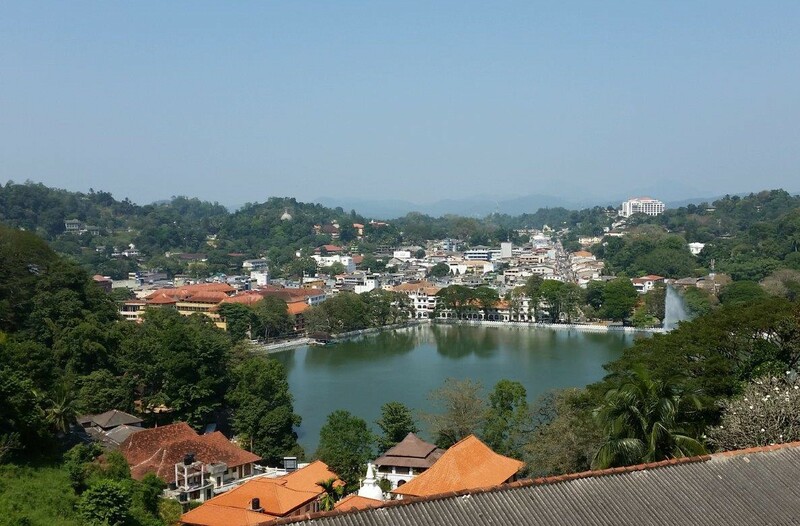 Overlooking the lake and Temple of The Tooth in Kandy. 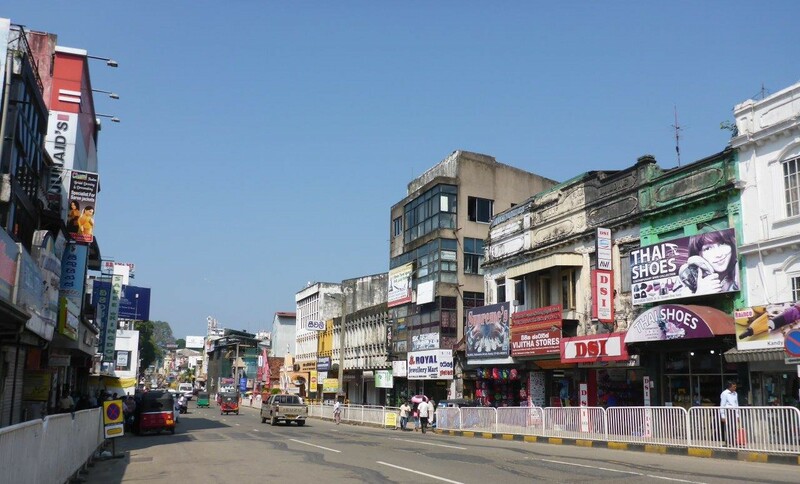 One of the main streets in Kandy, with plenty of commercial signs . Now to the bizarre part. 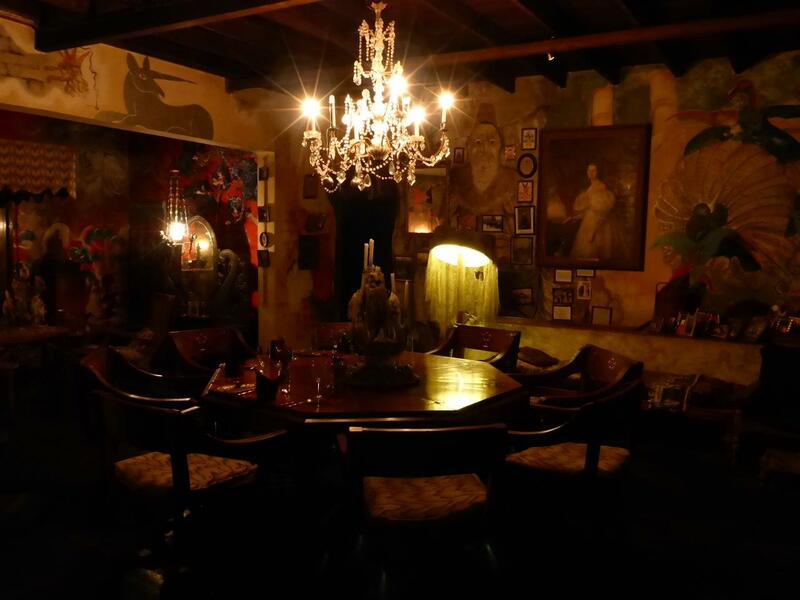 We decided to find a place for dinner nearby where we stayed, and found Helga’s Folly just around the corner. Arriving at the premises, the man at the front desk rolled out a large papyrus roll, with neatly scripture describing the menus for the various weekdays. The starter and dessert is set, but there is a choice of three different main courses. This in itself is not that strange. It is what awaits as the appetizer is served, that will knock you out. 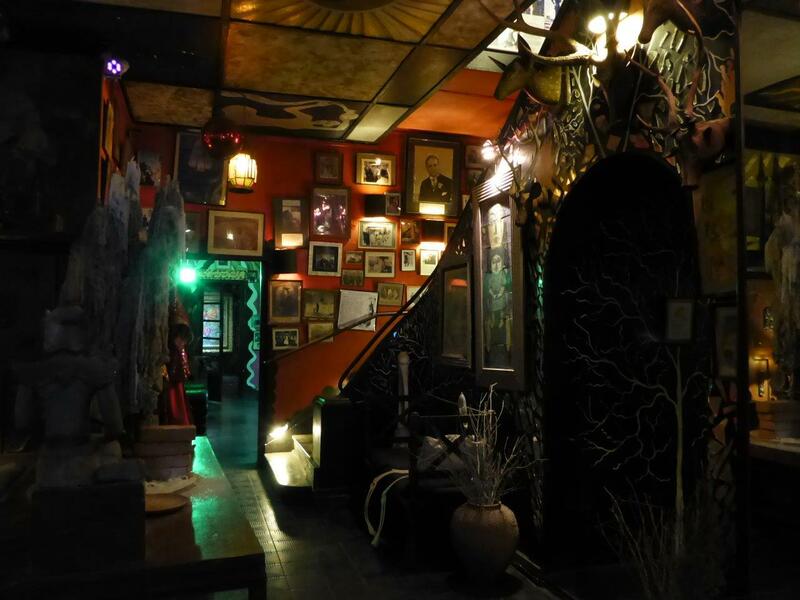 All the rooms are diverse, filled with props gathered from all over the world, of all thinkable styles. Chandeliers hang from the roof, softly lighting up the room with help from dripping candles. Photos and paintings are hanging all around. Alternatively just painted directly on the wall. The pictures show Helga’s family members photographed together with the many celebrities visiting throughout the times. Mahatma Ghandi being one of them. One of the more recent guests was Kelly Jones from Stereophonics, writing the single Madam Helga after his visit. Helga herself is still alive and kicking, living in the house together with her third husband. Before we left, we even got to talk to her, hearing exciting stories about her unique life. 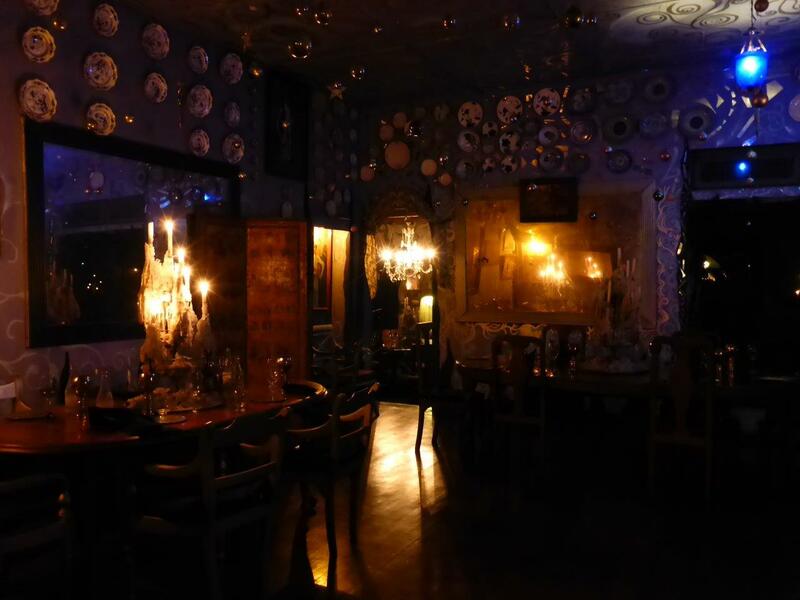 Truly a special evening in an extremely eccentric place. What can I say; you just have to go there to experience it yourself! Get amazed at Helga’s Folly.